We have fun when we learn in the Early Years Foundation Stage. If you would like to find out more about our learning during the EYFS, click on the link below. The following link is a parent friendly guide. It lets you know what to expect during the Foundation Stage. Reading and phonics are areas that parents always worry about. If you would like to give your child a head start; please download this Early Reading Leaflet. September 2018 fun in Early Years! To develop our fine motor skills we spend 10 minutes everyday doing Funky Fingers activities! We are twisting, squeezing, threading, pinching and our pencil grip gets better and better. We love Phonics in St.Andrew’s. The children are taught phonics soon after settling in. 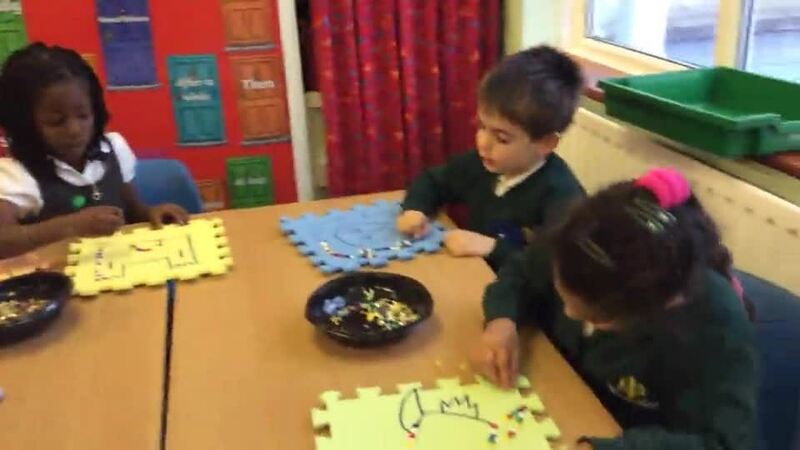 Using the Letters and Sounds programme, and cued articulation they quickly learn how to recognise letters and say sounds and apply these new skills to reading words. They work through phases 1-4 of the programme. Early Writing requires children to be confident with their mark making. In St.Andrew's Class we follow the Writedance programme incorporating essential physical development skills for writing, with the ability to make marks with confidence. We know that children learn through first hand experiences and finding things out for themselves. We ensure our curriculum contains many opportunities for Active Learning. We supplement our curriculum with visits to a castle and a farm. We assess children in the EYFS through direct observation and interaction. We record these observations using an online learning journey called Tapestry. You can log into this to find out about your child's learning and add your own comments and information. This information is all private to you. If you don't have an account yet ask Mrs.Thompson.